My little girl wanted to be an angel so I tried to make her the most beautiful angel costume that I could. It’s the accessories that make this costume special. 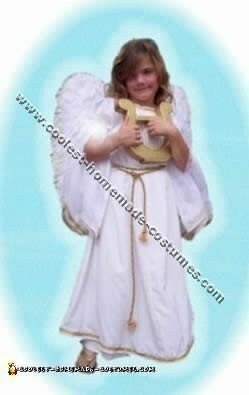 Angel Materials: basic angel dress pattern and specified fabric and materials, gold rope, feather wings, gold spray paint, gold craft wire, old metal head-band, block of wood, sand paper, old pair of flip-flops, wire cutters or pliers, hot glue and gun and skill or scroll saw to cut wood. I used a basic angel dress pattern from a major pattern company like McCall’s but dressed it up a bit with fancy materials. I used gold rope for the belt, Maribu feather wings from the Oriental Trading Co., made a "lyre" or "harp" out of wood with a skill saw by drawing and cutting it out sanded and spray painted gold. Used gold craft wire to look like harp strings; cut and glued them in place. Spray painted flip-flops. I braided several strands of the same length of the gold craft wire and wired into a round halo. Then I wired a piece of wire to the head band that would stand up and attach to the halo, making it "hover" about 4 or 5 inches above the head. 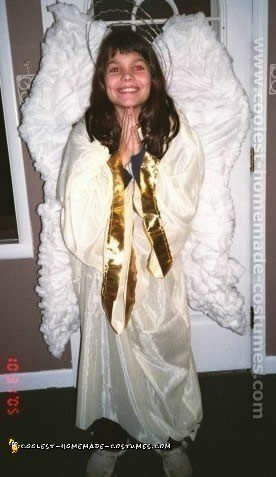 And then you have an adorable angel costume that you can use for Christmas time too! I started with window screen and cut wing shape out in one piece. I used cotton batting with clear fish line to bunch and stitch it on to the screen, both sides. I also turned over with pliers the edges of the screen, rather pokey if you don’t. I used straps from an old backpack covered with batting, then wired it into the wire screen top and bottom securely (backpack wings!). The dress was made with sheer fabric and gold ribbon stitched on the sleeves and neck. The wings had a tendency to want to fall back from the weight, so I added a belt around her waist., This costume was warm enough by itself in back of the batting.